Description: Sexes similar. 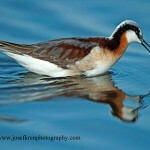 Large shorebird. Extraordinarily long decurved bill. Mottled cinnamon brown above; buffy with faint streaking below. Lacks head stripes; distinctive cinnamon buff wing linings visible in flight. 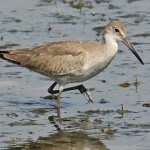 Juvenile is similar but has a shorter bill. Habitat: Sandhills grasslands, short-grass plains, and other grassy habitats. Nests occur in prairie vegetation on upland slopes. Where in Nebraska: Common migrant and summer resident in western part of state, especially in Sandhills area. Regular breeder. 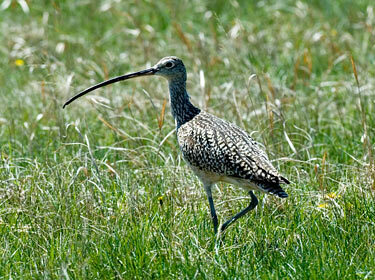 Fun Facts: Long-billed Curlews used to be hunted for their tasty meat, although now they enjoy full federal protection. 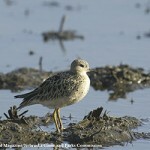 Its long bill is adapted to capture shrimp and crab out of deep burrows in mudflats.